You can use error bars in 2-D area, bar, column, line, xy (scatter), and bubble charts. In scatter and bubble charts, you can show error bars for x and y values. Note: The following procedures apply to Office 2013 and newer versions. Looking for Office 2010 steps? To change the error amount shown, click the arrow next to Error Bars, and then pick an option. Pick a predefined error bar option like Standard Error, Percentage or Standard Deviation. 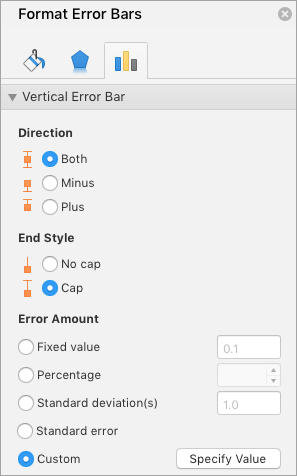 Pick More Options to set your own error bar amounts, and then under Vertical Error Bar or Horizontal Error Bar, choose the options you want. 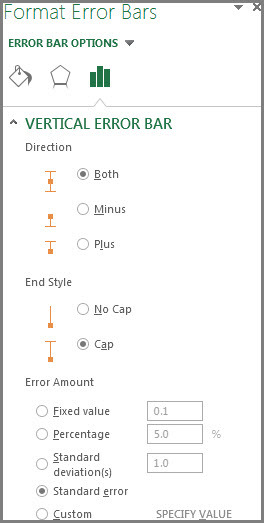 This is also where you can change the direction, end style of the error bars, or create custom error bars. Note: The direction of the error bars depends on the type of chart you’re using. 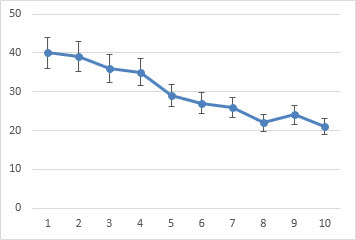 Scatter charts can show both horizontal and vertical error bars. You can remove either of these error bars by selecting them, and then pressing Delete. People often ask how Excel calculates error amounts. Excel uses the following equations to calculate the Standard Error and Standard Deviation amounts that are shown on the chart. In Excel, you can display error bars that use a standard error amount, a percentage of the value (5%), or a standard deviation. Standard Error and Standard Deviation use the following equations to calculate the error amounts that are shown on the chart. To add error bars to all data series in the chart, click the chart area. On the Layout tab, in the Analysis group, click Error Bars. Click a predefined error bar option, such as Error Bars with Standard Error, Error Bars with Percentage, or Error Bars with Standard Deviation. Click More Error Bar Options, and then under Vertical Error Bars or Horizontal Error Bars, click the display and error amount options that you want to use. Note: The direction of the error bars depends on the chart type of your chart. For scatter charts, both horizontal and vertical error bars are displayed by default. You can remove either of these error bars by selecting them, and then pressing DELETE. On the Layout tab, in the Analysis group, click Error Bars, and then click More Error Bar Options. Under Display, click the error bar direction and end style that you want to use. To use a different method to determine the error amount, click the method that you want to use, and then specify the error amount. In the Positive Error Value and Negative Error Value boxes, specify the worksheet range that you want to use as error amount values, or type the values that you want to use, separated by commas. For example, type 0.4, 0.3, 0.8. Tip: To specify the worksheet range, you can click the Collapse Dialog button , and then select the data that you want to use in the worksheet. Click the Collapse Dialog button again to return to the dialog box. Note: In Microsoft Office Word 2007 or Microsoft Office PowerPoint 2007, the Custom Error Bars dialog box may not show the Collapse Dialog button, and you can only type the error amount values that you want to use. On the Layout tab, in the Analysis group, click Error Bars, and then click None. Tip: You can remove error bars immediately after you add them to the chart by clicking Undo on the Quick Access Toolbar or by pressing CTRL+Z. In the chart, select the data series that you want to add error bars to. On the Chart Design tab, click Add Chart Element. 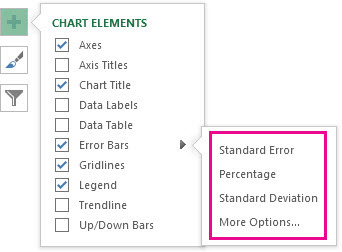 On the Chart Design tab, click Add Chart Element, and then click More Error Bars Options. In the Format Error Bars pane, on the Error Bar Options tab, under Error Amount, click Custom, and then click Specify Value. Under Error amount, click Custom, and then click Specify Value. In the Positive Error Value and Negative Error Value boxes, type the values that you want for each data point, separated by commas (for example, 0.4, 0.3, 0.8), and then click OK. Note: You can also define error values as a range of cells from the same Excel workbook. To select the range of cells, in the Custom Error Bars dialog box, clear the contents of the Positive Error Value or Negative Error Value box, and then select the range of cells that you want to use. In the chart, select the data series that you want to add up/down bars to. On the Chart Design tab, click Add Chart Element, point to Up/Down Bars, and then click Up/down Bars. Depending on the chart type, some options may not be available.